It all started when Turkish-Iranian gold trader Reza Zarrab was arrested in Miami in March 2016 upon his entry to the U.S. for allegedly evading a U.S.-imposed sanction on Iran, lifted three months before his arrest, with multiple money transfers. Turkish officials have argued that the case has been turned into a political move against Ankara. Turkey's claims regarding the matter actually were supported by the direct links between the judge overseeing the Zarrab case and the Gülenist Terror Group (FETÖ) led by fugitive preacher Fetullah Gülen, who has been living in self-imposed exile since 1999 in Pennsylvania. President Recep Tayyip Erdoğan has also slammed the U.S. administration, saying that the case is a political step taken against the Turkish state. The government accuses the group of exploiting the case by illegally obtaining and fabricating evidence such as manipulated wiretaps recorded by now-sacked FETÖ-linked police officers. Ankara says the so-called 'evidence' is illegal for a court to use under the United States law, as it is required that any piece of evidence must be obtained via legal means. Zarrab has pleaded guilty and testified as the prosecution's key witness at the U.S. trial of a banker on charges the two of them violated economic sanctions against Iran, ending weeks of speculation in a case that has strained relations between the U.S. and Turkey. Who are being accused in the case? What is Zarrab being accused of? 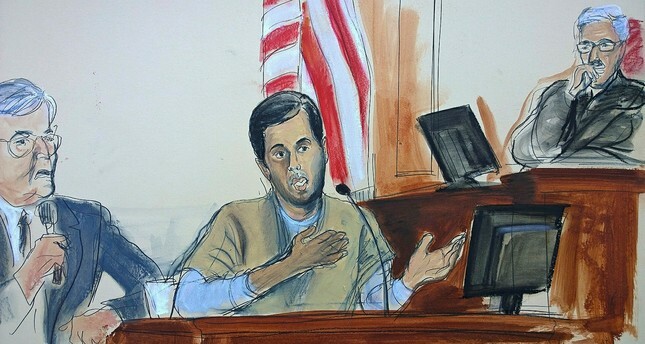 The revelation came Tuesday as a defense lawyer asked for a two-week delay of the New York City trial of Mehmet Hakan Atilla, deputy CEO of Halkbank, saying he needed time to prepare for Zarrab's testimony. Defense lawyer Robert Fettweis said prosecutors recently released 10,000 pages of evidence related to Zarrab, including emails. Defense attorney Victor Rocco raised questions over Zarrab's credibility in his opening statement at the trial, saying the case was really about Zarrab's crimes. He said Zarrab made a deal to get out of jail free, possibly joining the U.S. witness protection program so that he and his family can live in the United States. According to Aydınlık daily, Zarrab was concerned about his own safety in Turkey upon the arrest of his alleged partner billionaire tycoon Babak Zanjani in Iran, and got in touch with U.S. authorities, even meeting with three agents from the Federal Investigation Bureau (FBI) in Istanbul's Tarabya district. According to the newspaper, Zarrab struck a deal with them. Three months after the meeting, he knowingly left for the United States and was promptly arrested after his arrival in Miami. U.S. authorities "took any measure necessary so that Turkish officials would not stop him from leaving the country," the daily reported. 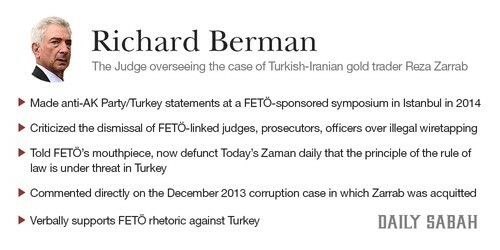 Richard Berman, the judge overseeing the case in New York, came to Turkey after the failure of the FETÖ-led Dec. 17-25 2013 operations, the so-called "corruption inquiry" which was a plot perpetrated by the FETÖ to topple the democratically-elected government. He arrived in Istanbul shortly after the incident to attend a symposium on "justice and the rule of law," organized by the FETÖ-linked Yüksel Karkın Küçük Attorney Partnership. In the symposium, Berman targeted the ruling Justice and Development Party (AK Party) government and claimed that Turkey was governed by a "one man rule" and suggested that the current administration must be changed — ideas which were consistently propagated by FETÖ supporters. Berman even criticized the dismissal of FETÖ-linked judges, prosecutors and police officers over unlawful wiretapping charges. While in Istanbul, he gave an interview to the FETÖ-funded and now defunct Today's Zaman daily, and claimed that the principle of the rule of law is under threat in Turkey. His comments were directly related to the December 2013 corruption case in which Zarrab was acquitted. Preet Bharara, the former prosecutor behind the controversial case, has also been also criticized for his links to the FETÖ. He is accused of using the same summary of proceedings used by FETÖ-linked police during the Dec. 17 operation, and has many times retweeted and supported FETÖ sympathizers on his official Twitter account. Bharara also worked with Democratic heavyweight New York Senator Chuck Schumer as his chief council until 2009, and was subsequently nominated as United States attorney for the Southern District of New York by his former boss. Schumer is also known for his proximity to FETÖ in the U.S. and has allegedly received thousands of dollars from Gülenist donors, while being an outspoken critic of President Recep Tayyip Erdoğan in speeches he has given at FETÖ-run entities like the Washington-based Turkic American Alliance. He allegedly earns around $2.5 million annually from the FETÖ through the Steptoe & Johnson law firm, hired to prevent FETÖ leader Fethullah Gülen's extradition to Turkey. 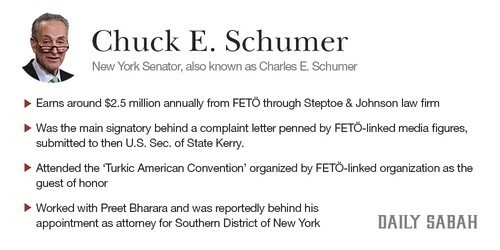 Schumer was also the main signatory behind a complaint letter penned by FETÖ-linked Zaman daily's editor-in-chief Ekrem Dumanlı and Samanyolu TV-owner Hidayet Karaca, submitted to then-U.S. Secretary of State John Kerry. He attended the 'Turkic American Convention' organized by the FETÖ-linked Turkic American Alliance as the guest of honor. The case targeting Zarrab over sanction evasion, which has fueled tensions between the U.S. and Turkey, broadened after the arrest of Atilla. Ties between Turkey and the U.S. became deeply strained as a result of the lack of timely support shown by the Obama administration in the aftermath of the failed July 15 coup attempt in 2016, organized by FETÖ. Ankara has also criticized Washington for the slow progress on Turkey's aim to extradite Pennsylvania-based Gülen, saying the U.S. is handling the situation based on political motives.